Trying to define something, even from the inside-out as I am attempting to do with my definition of Connectivism, introduces the sticky issue of essentialism. According to Wikipedia, Richard Cartwright has defined essentialism as "the view that, for any specific kind of entity, there is a set of … attributes all of which are necessary to its identity and function." In his book From Bakunin to Lacan: Anti-Authoritarianism and the Dislocation of Power (2001), Saul Newman says that essentialism is the core political and philosophical issue of our age. The problem with essentialism is that it gets all tangled up in power. Some people always appropriate the power to define what others should be and who belongs inside the blessed group and who is relegated to the outside. The problem for Connectivism is that essentialism implies a nugget at the core of any entity or knowledge that is indivisible and indispensible and that is transferable to others of similar kind either through genetics or through social, religious, educational, or governmental ritual blessings. I think I have tried to avoid essentialism through my use of the term DNA. In other words, I have started my definition of connectivism by talking about the DNA of connectivism, but this DNA can quite easily be viewed as essential, and taken one step further, as essentialism. It is a short intellectual step from saying, "At the core of connectivism lies the conviction that knowledge is a network phenomenon," to saying "Connectivists must believe that knowledge is a network phenomenon." It doesn't help much, to my mind, to say that the first view is descriptive and the second is prescriptive; so before I continue defining connectivism, I want to address the issue of essentialism. 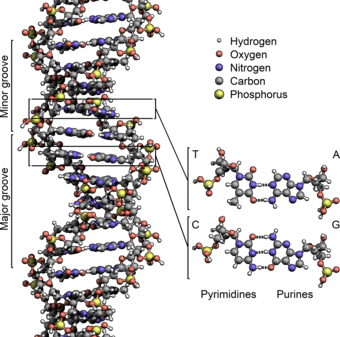 Which of those nodes in the spinning double helix above is the essential characteristic that you are positing for whatever life form emerges from this DNA? The correct answer is none of them. The essential attribute that we want to assign to any entity is always an emergent property of some network, and that network is itself an emergent property of some other network, all the way down to strings (at least, we think so now—strings are as far down, or in, as we can push reality just now). The DNA that provided the starting point of Keith Hamon was itself an emergent property of a network of genes, which were a network of smaller things, all the way down. While we can actually locate the gene for my blue eyes in that spinning double helix above, my blue eyes aren't there in that DNA sequence. None of me is there. I am an emergence of this DNA, which forms a starting point for me, but is not sufficient to explain me. Though I cannot ignore this DNA in trying to define myself and become myself, I cannot reduce myself to this DNA, either. What is essentially me, then, is a dynamic interaction of networks on scales below me (DNA, for instance) and scales above me (society, for instance). I emerge both from the givens of those other scales (a gene for blue eyes and a meme for Judeo-Christian culture) and from the interactions between myself and those other scales. The interactions of characteristics on the scale of me with my DNA on one hand and society on the other (to pick just two other networks to which I belong) not only perturb me, but they also perturb those other networks. So where are the essential, stable characteristics of me that one can point to? I don't see them. If you see them, then you are focusing on one particular network scale and calling that the essential scale. I think you're wrong. I am not quibbling with words here. I'm pointing to a problem with shifting among network scales, or levels. Any characteristic that I note at one network scale—my blue eyes, for instance—disappears when I shift down or up to another network scale. Moreover, those characteristics tend to shift through interactions with the other scales. The beauty, the meaning, and the passion for learning that we recognize in this poem (what we might call the poem's essence) is an emergent property. As soon as we dissect the poem into its individual words, we lose the beauty, the meaning, and the passion. We lose the poem. Though the poem absolutely depends on the properties of those individual words and sentence structures, it cannot be reduced to those structures. It cannot be reduced to the sonnet form: fourteen iambic pentameter lines arranged in two parts of two quartets and two tercets. Those things are essential starting points, DNA, but they ain't the poem. So what prevents DNA from sliding into essentialism for me is that DNA is a beginning point not an ending point. It is a generative point, not a fixative point. It is where you start becoming, it isn't what you are. But I can also avoid avoid entangling DNA with essentialism by distinguishing between two kinds of essentialism. I owe this distinction to a discussion about essentialism with Bruce Hood on the Edge website. Hood, an experimental psychologist, talks about what confers identity and uniqueness, and he works with two concepts that he picked up from the Medieval philosopher John Duns Scotus: quiddity and haecceity. Quiddity is the invisible properties, the essence shared by members of a group, so that would be the 'dogginess' of all dogs. But the haecceity is the unique property of the individual, so that would be Fido's haecceity or Fido's essence, which makes Fido distinct to another dog, for example. I think that quiddity is the aspect of essentialism that troubles me most, for it is the kind of essentialism most implicated in my mind with the abuse of power. Quiddity views an entity solely as a member or not of a particular group. Haecceity, on the other hand, sees an entity as itself. In Haecceity, then, essentialism is not what confines a person to one group or another, with all the resulting social, economic, and political implications of such an assignment; rather, essentialism is what distinguishes one entity from all else. For me, that essentialism is the intersection of all the biological, social, intellectual, emotional, spiritual, political, and economic arcs that run through my life to meet in this place called me at this time. In Randall Collins' terms, I am the precipitate of all those different arcs. I am the result of shifting warm fronts and cold fronts, rising and falling barometric pressure and humidity, shifting winds, that all converge to make me sunny or cloudy, cold or warm, balmy or stormy. I can deal with this sort of essentialism. What I can't accept is static essentialism—weather that never changes. By the way, I don't mean to imply that Bruce Hood would agree with my use of these terms or my definition of essentialism. I think he is talking about essentialism in a slightly different way, but without reading much more, I can't say for sure. I'm using these terms to suit my own purposes. I happen to think the self is a narrative, and I use the self and the division that was drawn by William James, which is the "I" (the experience of conscious self) and the "me" (which is personal identity, how you would describe yourself in terms of where are you from and everything that makes you up in your predilections and your wishes for the future). Both the "I", who is sentient of the "me", and the "me", which is a story of who you are, I think are stories. They're constructs and narratives. I mean that in a sense that a story is a reduction or at least it's a coherent framework that has some causal kind of coherence. This actually resonates with the ideas of John Locke, the philosopher, who also argued that personal identity was really dependent on the autobiographical or episodic memories, and you are the sum of your memories, which, of course, is something that fractionates and fragments in various forms of dementia. … As we all know, memory is notoriously fallible. It's not cast in stone. It's not something that is stable. It's constantly reshaping itself. So the fact that we have a multitude of unconscious processes which are generating this coherence of consciousness, which is the I experience, and the truth that our memories are very selective and ultimately corruptible, we tend to remember things which fit with our general characterization of what our self is. We tend to ignore all the information that is inconsistent. We have all these attribution biases. We have cognitive dissonance. The very thing psychology keeps telling us, that we have all these unconscious mechanisms that reframe information, to fit with a coherent story, then both the "I" and the "me", to all intents and purposes, are generated narratives. The illusions I talk about often are this sense that there is an integrated individual, with a veridical notion of past. And there's nothing at the center. We're the product of the emergent property, I would argue, of the multitude of these processes that generate us. If even our sense of self is ever shifting under the influence of forces that we don't control and are hardly aware of, then where is the static essentialism that people want to discover in others and in the world? I don't think it exists. Rather, identity emerges in the interplay of lights that illuminate the dark from time to time, with different colors, different intensities, and different angles. We form these shifting lights into patterns that help us make sense of what we see only dimly, and we postulate a position for ourselves in this light show. Identity emerges from this, and then the lights change. Damn! Well, this didn't go exactly where I thought it was going, but that's what makes it fun. I'll tell you a story about my hippie friend Boer. It was a cold, winter's day in 1970, and I was sitting with Boer as he tripped on acid. He asked me for a piece of paper, announcing that he wanted to write his name. He took up a pen and then paused, before saying, "I don't want to write my name. I already know my name. I want to write something I don't know so that I can read it and learn." This has been my ambition for the past forty years. Sometimes I almost get there. I read with interest this morning an article by Thomas Frey called The Rise of the SuperProfessor, in which Mr. Frey forecasts the emergence of a class of elite professors who "consistently demonstrate excellence, passion, and clarity, throughout their academic careers" and who brand themselves and market their teaching excellence to the world, unencumbered and unsupported by the towers of academia. The superProfessors manage this rise, of course, through the affordances of the Net (thanks to Bon Stewart for my new favorite term, affordances, and to her excellent session in Change11). Mr. Frey notes the usual examples: Stanford professors Sebastian Thrun and Peter Norvig, edX, the Minerva Project, the University of the People, iTunesU, Khan Academy, Learnable, Udemy, Codecademy, and Udacity. As I was reading, it dawned on me that I had seen this same transition before, but in churches, and I think that a quick look at what's emerging in traditional Christian denominations might be instructive for institutions of higher education. Over the last 30 years or so, lots of SuperPastors (if you see an uncomfortable similarity to the term SuperProfessor, well … ) have discovered that they do not have to rely on a hierarchical denomination to build a whopping big church; rather, they can leverage those two great networks—the interstate superhighways and the information superhighway—to build churches that are as big as most state universities. Denominations have existed for centuries to provide local, usually small, congregations with the material, logistical, and organizational support that a small congregation could not provide itself. The local congregation needed an official denomination to sanction rituals, bless ministers, provide policies and procedures, print hymnals and Sunday School material, and so forth. In return, the local congregation sent financial support to the home office. But SuperPastors such as Rick Warren at Saddleback Valley Community Church in Lake Forest, CA, and Joel Osteen at Lakewood Church in Houston, TX, have discovered that they can get all of the logistical and material support they need without the encumberance of a centuries old hierarchical structure. They have swapped encumberance for affordance, and it works. These churches are wildly successful, at least in economic terms. According to a Forbes article, the top ten megachurches earned $8.5 billion dollars in 2009. The point for me is that SuperPastors are learning that hierarchies are not an efficient way to deliver a message and build a community around that message, regardless of the message. Sebastian Thrun seems to have come to the same conclusion. He has a gospel that he wants to preach to the masses, and he has figured out that Stanford University is just too limiting. The MOOCs that Siemens, Downes, and Cormier have delivered over the past few years demonstrate the same principle: that a dedicated group of SuperProfessors can assemble sufficient infrastructure to build and sustain educational enterprises that do not require a traditional hierarchical institution. Even if they preserve their ties to an organization, they don't require them (many of the megachurches preserve their association with a denomination, but everyone knows that the denomination needs those megachurches more than the churches need the denomination). The Internet itself can provide all the material support, sanctions, specifications, and transactions necessary to create an educational institution. Or a church. I see Connectivism as an ideally positioned concept to help higher education transition from a hierarchical model to a network/rhizomatic model. And the rhizomatic university will come about. I think it's a certainty. I'm just troubled by who will become the first Jan and Paul Crouch of online higher education. And I'm just a bit annoyed that these conservative ministers have made the shift to the rhizome before we liberal educators have. I thought we were supposed to be the more flexible and open-minded. Imagine that: conservative Christian pastors as pioneers of post-structuralism.